It's not a mind-blowing upgrade, but it is a decent excuse to pick up 2009's open world game again. It's a damn crime that no game ripped off Red Faction: Guerrilla's Geo-mod destruction feature. You take a hammer, and you use it to smash out a panel of a wall and break through a pillar. Smash out a few more walls, and maybe the building creaks. A few more whacks of the hammer later, and the whole thing comes down, perhaps with you inside. And hey, maybe it knocks through another building on the way down. It's still amazing to watch. Guerrilla does this one thing really well. It's an otherwise uninspired open world game, with okay driving, unimpressive shooting and a boring story. Hell, Mars doesn't even look that nice, because it's Mars. But knocking down buildings in an open world is more than enough to carry this game. You'll crash a jeep through a base. You'll detonate mines and blow up a bridge, which will then collapse on top of an enemy settlement. You'll melt the beams of a tower and watch it fall over. This destruction felt great in 2009, and it still feels good now. In this Re-Mars-tered edition, which is free for owners of the Steam version as of today, THQ Nordic touts heavily reworked textures among other visual improvements, along with better shadows, lighting, a shader and postprocessing rework and native 4K support. The new version is a 24.3GB download, while the existing Steam edition is 6.7GB. For a freebie, it seems pretty good after four hours or so. I can't say I really notice vast visual improvements on my strange 1050p work monitor, but environmental textures like rocks and the ground look a little sharper up close. The lighting is nice by today's standards, too, but it's not a vast upgrade. With my work PC (Intel I5 3570K@3.40GHz, 8GB RAM, Nvidia GeForce GTX 970), I'm getting around 90-120FPS depending on how busy the situation is, which is fine for a new version of an almost decade-old game. This edition may just give you a reason to play it again, which is fine by me. It costs $20. If it's not in your Steam library already after years of deep discounting and bundling, you should probably wait for a future sale. To anyone picking this up for the first time, I recommend focusing on the campaign. That's where the biggest destructive opportunities are, like a huge bridge and a massive tower, which take meticulous use of the object-melting nano rifle and rocket launcher to bring down. You'll wait a while to unlock all the really good toys, but the singleplayer will give you plenty to blow up along the way, as well as a dull story about miners rebelling against an army that's a bit like a boring version of Firefly. The big destructive opportunities in this campaign need to be seen, though—I still talk about them with friends years later. I'm not really in the mood for finishing the campaign these days after doing it twice before, but that's where the game's Wrecking Crew mode comes in. It's basically a score attack that gives you a quick dose of the game's destructive physics in a variety of settings. You pick a loadout, set the parameters like time limits and how easily the buildings fall, then knock them down as quickly as possible. It makes a great pass-the-pad party game, and there's a challenge mode with leaderboards, too. I have played this mode every year for nine years, and I will never stop. Sadly for me, all of the leaderboards have been reset from the Steam version, meaning I'm no longer 12th best in the world on the Abandoned map. Oh well. Wrecking Crew is where it's at: it's all the good bits of Guerrilla with none of the waiting around for the best weapons or opportunities. Over the years, I've probably played it more than the campaign. It's weird that no one else made a game like Guerrilla after its release. Destruction features in everything from Battlefield to Minecraft to Just Cause, but Volition's game still offers something that no other game does. It's the idea of blowing each building up like it's a physics puzzle, efficiently using your arsenal so it collapses in the most satisfying way possible. It might've been Red Faction's sparse Mars setting that made Guerrilla work in the first place. It's noticeable that all the biggest and best buildings are far away from each other, and it probably wouldn't have been possible for Volition to replicate the Geo-mod system in the vast cities of Saints Row. But that is the type of open world game I've always wanted to play, where you can manipulate the environment and feel like you've left a mark on it. We're instead in an age of open world games packed with busywork and towers to climb. I like those too, but Guerrilla shows open worlds and destructible buildings are a perfect match. Even old THQ didn't seem to know why Guerrilla was good. Volition followed this up with Armageddon in 2011, a bad sequel that kept the destruction, but took us away from big open set pieces to the tedious, more linear underground. It just squandered everything this game was good at—and seemingly killed the series. What a waste. It was the most disappointed I've ever been by a sequel, and was once described to me ahead of release as being like Dead Space, which couldn't have been less accurate. 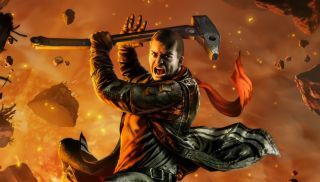 Still, if THQ Nordic is bringing Darksiders back for another shot, perhaps Red Faction will get its chance again too. I just wish its influence, and its collapsing buildings, had carried a little further.